Coaching at Arawa includes paddlers at all levels - from beginners to through to National representatives. There are three branches of coaching at Arawa – Multisport, Sprint, and Juniors. Each of these is dealt with separately below. Club coaches offer their time and expertise on a voluntary basis to provide members with the opportunity to develop their skills in a friendly, supportive environment. Much of our club membership is made up of paddlers who are either recreational paddlers, or are involved in multisport racing for events such as the Classic River Race or the Coast to Coast. If this is you, then please consider our Multisport Coaching Sessions below. We have some great coaches who would love to help. Our beginner training sessions are aimed at those new to our sport and are free of charge for members. If you want to try kayaking, you can attend three sessions free of charge before we ask you to join the club. We can supply kayaks, paddles and life jackets, but be aware, if you are using club gear you will need to get there early, as it is "first in, first served" and people have their favourite items! We have a limited number of club beginner boats. he first time you come down it pays to arrive around about 15 minutes early. This will allow time for our team to show you where everything is and to help you select an appropriate boat. A tour of the club facilities. Education around safety and the rules of the Avon River (lifejackets must be worn by beginners – no exceptions). Instruction in the selection and use of club equipment. Instruction in basic paddling technique. An onwater lesson – Sessions are held wet or fine. If conditions do not permit getting on the water, the lesson may be conducted upstairs at the club using the paddling ergometers. You must be over 15 years of age to attend. We do ask that beginners are able to swim and have a reasonable level of water confidence, to the extent that they can get to the bank in the event of capsize. The main focus of the beginner sessions is getting good habits built in at an early stage – power and speed come later. Most of our beginner session paddlers are aiming for the Coast to Coast, so the coaching is broadly structured around that goal. If you intend to do the C2C, get started with your paddling as soon as you can – April/May/June will ensure you get enough paddle skills and miles under your belt to ensure you enjoy the Waimak, rather than grovel and swim your way down. In the cooler months thermals and socks are a great idea and in the summer you may be lucky enough to need sunscreen! Booties (wetsuit) are a great idea. Check out what everyone else is wearing to figure out what will best suit your needs. Don’t forget your smile and remember – this is a water sport, so don’t let a bit of rain put you off! If you have been attending our beginner sessions, and wish to take your paddling to the next level to be able to participate in Weedies sessions and possibly do some racing, you may like to engage a coach. Check out our find a coach section, or our networking section (coming soon) which may be of help. If this is what you are wanting you will find a list of commercial operators below. This details some commercial operators with whom you might like to make enquiries. The list of commercial providers has been compiled from direct contact with the companies concerned. Please be are aware that there are other providers in the marketplace. No representation is made as to the quality of services provided, this is simply a list of those who have got back to us. It is the responsibility of the individual to satisfy themselves of quality before committing to a provider. The order in which providers have been placed in this list is in no way an indication of quality or preference. Providers are simply added to the list in the order that we receive them. The Weedcatchers sessions are almost as old as Arawa! These sessions are held on Thursdays at the first downstream bridge at 5:45pm. You’ll want to leave the club no later than 5.30 to give yourself time to reach the bridge. You don’t want to exhaust yourself before the session starts! Weedcatchers is a high intensity interval session for more advanced kayakers. Coaches change weekly, and each coach has their favourite sets, so be prepared to be challenged differently each week. Although you can just turn up to these sessions if you wish, we do want your experience to be a good one. You want to be stable in your boat and be able to paddle on your own for at least an hour. These sessions are a great way to meet fellow paddlers, test yourself, and push yourself that bit more than what you would on your own. The format of the session is designed to accommodate different paddling abilities so just ask who is coaching and have a chat and they’ll put you in the appropriate group. The first Thursday of every month the Weedies Crew converge on the The Bealey Steak and Ale House for a post Weedies catch-up and a bite to eat. We do tactfully suggest that if you've been for a paddle you take a shower first! Arawa do not provide coaching or examiners for Grade 2 certificates. If you are interested in this, please contact one of the providers readily contactable through the internet. Most members looking to complete a Grade 2 Certificate are doing so for the purpose of competing in the Coast to Coast multi-sport race. The race organisers maintain a list of current certification trainers and assessors. List can be found at the following link: River Kayaking Instructors and Assessors. Kayak sprint is a very fast and exciting Olympic sport raced over distances from 200m to 1000m. Events are raced in single kayaks(K1’s), and 2 and 4-person team boats (K2’s and K4’s). New Zealand is currently enjoying a high level of success in this sport at an International level. At National level, Arawa teams race in all categories from 13years, 14years, 16years, and 18years and under, to Open, to Masters, to Novice. Opportunities also exist for paddlers to involve themselves in marathon kayak racing over much longer distances. There are several competitions that we contest each year locally and also in Twizel, Rotorua, and Cambridge (Lake Karapiro). 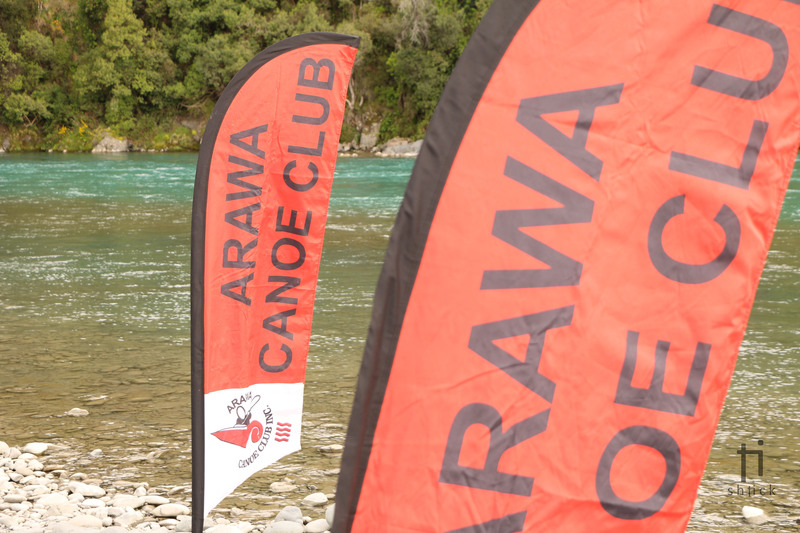 Arawa currently has ten paddlers representing New Zealand internationally at Junior, Senior, and Paralympic level, and our club holds the National trophies for being NZ’s Top Club, Top Tyro club (U13’s), Winner of the Club relay, and Top Junior Club. Canoe Racing New Zealand have been developing a national High-Performance pathway in recent years with a view to seeing more New Zealand athletes performing on the world stage, and there is now a very clear pathway to the top. Arawa currently have 11 young paddlers on this pathway, showing the strength that we are developing in the junior ranks. These athletes attend regular camps at Lake Karapiro in Cambridge where they receive expert coaching to develop the skills required to perform at the highest level, and are drilled in team boats with those they are likely to be involved with in international teams in the future. Arawa are also lucky to have several top coaches who work with athletes at local, national, and international level. Juniors are classed as paddlers under the age of 18 years, and generally begin paddling with our Sprint Development Programme (see below) to develop sound technique and training habits. This squad's focus is on developing sprint kayak paddlers whose goal is to race either kayak sprint or marathon disciplines. We also regularly assist young surf lifesavers interested in paddling surf ski, and who wish to establish good technique from the start, or to improve their existing technique. The group caters to paddlers from absolute novices through to Open paddlers at New Zealand representative level. We have a great group of very involved parents, and a strong supportive group culture. We also work hard, and we have a lot of fun. Paddlers can begin racing at the age of 8 years, so we will generally accept paddlers from that age onwards, but in saying that, every paddler needs to be reasonably competent in the water, to the point that they can make their way to the bank if they were to capsize. For those who decide to join the squad, we have regular technique and training sessions on the water, together with gym sessions, Pilates, and a weekly boot camp session. Meeting with the coach at the local café on a Saturday morning is also an important chance to debrief for the week and plan for the future. There are several other smaller groups of Masters and Open K1 paddlers at the club who train together in self-managed groups on a more informal basis. We also have one ‘para’ sprint paddler, and have recently had a ‘C1’ canoe sprint paddler join the club. Arawa is very fortunate to have a committed bunch of wonderful volunteers willing to share their knowledge and experience. If you're looking for help, you've come to the right place. Coaching is a very rewarding activity. There are always opportunities to learn and develop coaching skills which lead to a greater understanding paddling technique and what it takes to make a kayak go faster for longer. We are always looking for new coaches to help spread the volunteer work load. If you are interested in becoming a coach, have a chat to any of the current team or contact the coaching coordinator. Freedom Fitness and Coaching is all about giving you the freedom and expert coaching to help you on your journey to reach your sporting goals – There is no limit to what these dreams may be. Rosie Shakespeare: Post Grad Dip Sports and Exercise Medicine with credit, Cert PT, RN. Kayak one on one technique video sessions. Tuesday morning interval session for all abilities. Endurance coaching and programs for kayakers, cyclists, runners, multi-sport and adventure racers. Canterbury Kayaking Ltd runs regular four-day skills courses on Canterbury's rivers. We specialise in grade 2 certification, whitewater skills, and Coast to Coast preparation. We believe in learning to roll early, and value a whitewater foundation for successful multi-sport racing. All our coaches are fully qualified through NZOIA, and hold either degree or diploma level awards in outdoor instruction. The Paddle Clinic is designed to fill in the gaps for paddlers at all levels. We see the challenges athletes face and provide high quality coaching at great value for money. Brought to you by Leigh Barker, a high performance coach and Chris Stagg, a multisport white water coach, The Paddle Clinic has you covered for everything needed to have a great paddling career, whatever your goal. Develop your wing paddle and dynamic skills enabling you to feel confident to join groups such as Freedom Fitness & Coaching tuesday mornings and Weedies Club Training nights in the quickest, most effective way. Be better prepared for your Grade 2 Course to enjoy it and get the most out of it. Take your paddling ability to the next level. Tailoring training programmes for you and/or work with your multisport coach to work in with your existing training schedule. Team CP Ltd is an endurance sports coaching company that specialises in Coaching people to complete or compete in the Coast to Coast. To ensure that you are able to turn up to perform to your potential on race day we need to ensure you are moving efficiently. To do this we put a big emphasis on technique. We offer small group or individual paddling technique sessions using video analysis to coach you to improve your paddling efficiency. By doing this you will go faster and enjoy your paddling more! Contact us to have your details posted here.